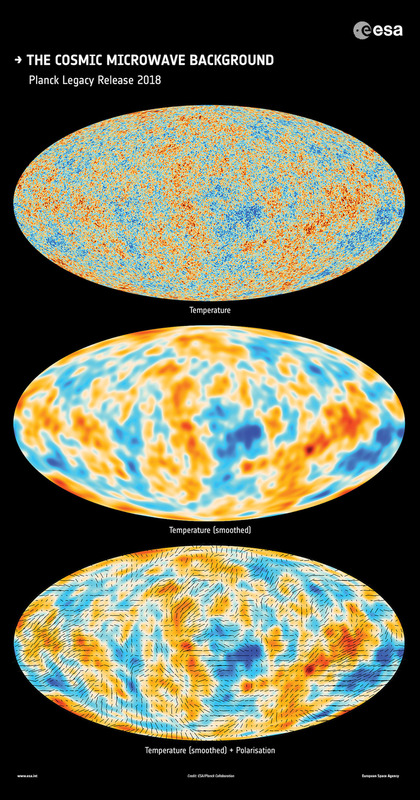 The top view shows anisotropies in the temperature of the CMB at the full resolution obtained by Planck. In the middle view, the temperature anisotropies have been filtered to show mostly the signal detected on scales around 5º on the sky. The lower view shows the filtered temperature anisotropies with an added indication of the direction of the polarised fraction of the CMB. These images are based on data from the Planck Legacy release, the mission’s final data release, published in July 2018.